Pac-man is funny if you think about it. The concept of a yellow smiley face that goes around eating pills while four ghosts (named Blinky, Pinky, Inkey, and clyde) are chasing you around. Namco must have been of their rocker when they came up with this brilliant idea. This game is one of the best games ever. 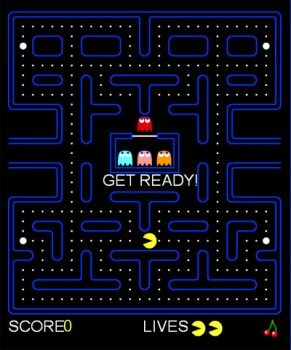 The scores on this game allow you to play Pac-Man online against your friends. See who can get the high score. Playing free pacman is fun for all ages. We would like to thank those who created original pacman game. It is mostly a copy of the Pac-Man bundled with the Arcade classics. I don't recommend this. Bundled with adware that is required or the game wont plat.